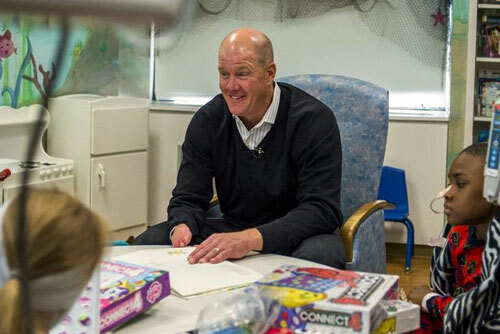 FLINT, MI — Former MLB pitcher, Jim Abbott, made a special appearance on Thursday, March 19, on behalf of his partnership with United Way to help promote the childhood literacy project. Abbott started the day around 9:30 a.m. at the General Motors Flint Assembly plant on Van Slyke Road where the GM Foundation presented a $70,000 check to the United Way to help its new early childhood literacy project, “A to Z Learn With Me.” On Thursday night, he was the keynote speaker for the United Way of Genesee County Campaign celebration. Source: Mlive.com. After the GM press conference, Abbott made a few hospital visits. He read children’s books, played games and signed autographs for Teron Jones, Kylie Taylor, Dwight Laster and Kayden Lee in Paige’s Playroom of the pediatric unit at Hurley Medical Center. He also interacted with new families in the maternity ward, pediatric and joint rehab units at McLaren Regional Medical Center and Genesys Health Center. Jim Abbott is a Flint native and former Major League Baseball pitcher who played despite having been born without a right hand. He played for the California Angels, New York Yankees, Chicago White Sox, and Milwaukee Brewers from 1989 to 1999. In 1992 Jim Abbott was awarded the Tony Conigliaro Award, given annually by the Boston Red Sox to a Major League player who overcomes an obstacle and adversity through the attributes of spirit, determination, and courage that were trademarks of the Boston star. He continues to work with the United Way of Genesee County to help local families get a kick-start on learning through the new education initiative and has co-written a book with his 18-year-old daughter Mandy Abbott titled “Follow Your Dreams,” which will be distributed to local newborns and their parents. He is currently a sought after motivational speaker. Sports Speakers 360 is a booking agent for pro athletes. If you would like to book Jim Abbott for a speaking engagement, appearance or endorsement, contact Jim Abbott’s booking agent for fees at 1.855.303.5450.